Thomas Myers, a former student of Ida Rolf (the founder of Rolfing), has done a wonderful job of bringing the concepts of fascia and movement into the mainstream strength and conditioning world. Reach down and try and touch your toes. Roll the bottom of each foot for about sixty seconds. Reach down and try and touch your toes again to see if you improved your range of motion. The goal of rolling the foot was to address the plantar fascia, since the plantar fascia starts this line, which in turn would have a positive effect on the entire superficial back line creating greater extensibility and allowing you to bend over further. It seems that whenever a trainer talks about Thomas Myers or Anatomy Trains, the only thing they talk about is the superficial back line and how interesting it is that it connects the plantar fascia to the scalp and how rolling the bottom of the foot improves the toe touch. While I wont discount the importance of the superficial back line, I think that trainers can learn a lot from digging deeper into some of the other lines. The deep front line, in my opinion, is really where all the action takes place! I have bolded some of the major players in this line. These muscles seem to come up frequently when we talk about training our clients, and the importance of these four structures is why I feel that the deep front line is where the action takes place. Breathing is essential to keep us alive, but breathing well is essential to good movement! While this line starts at the lower leg with the posterior tibialis and moves upwards, Myers states that this line really starts on the front of the spine, as the deeper line parallels our ontogenesis (development of an organisms) to a greater extent and does not follow our bodies outer geometry as the more superficial lines. While improper breathing patterns can create a variety of physiological problems (reduced availability to oxygen, respiratory alkalosis, “anxiety breathing”, headaches, and general fatigue, etc. ), these poor patterns can also have biomechanical implications as well. Poor thoracic spine movement, increased forward head posture as accessory breathing muscles (SCM, scalanes, Upper traps) take over, altered shoulder function and scapular position/mechanics, increased tone of the erector spinae muscles and decreased pelvic floor strength leading to potential instability at the lumbar spine. Do those issues describe a lot of your clients? 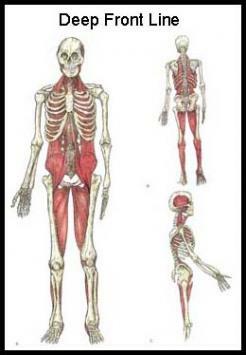 Looking at the deep front line alone, poor breathing will have a negative effect on the entire line and especially on the four muscles I highlighted earlier – Posterior tibialis, Psoas, Diaphragm, and Scalenes. When the diaphragm does not function properly and the client is an upper chest breather, the scalenes are one of the accessory muscles that take over to assist in normal respiration. These muscles can become hypertonic and develop trigger points that can refer symptoms similar to thoracic outlet syndrome, carpal tunnel syndrome, as well as aches/pains in the upper back (near the medial border of the scapula). In an upper chest breathing pattern, the diaphragm does not move downward (think belly breathing), casuing the erector spinae to become hypertonic. This will often cause the client to become hyperlordotic, as there is increased tone at the thoracolumbar junction and the lower ribs are pointing upwards rather than remaining in a more caudad position. Hyperlordosis is a common pattern we see in clients, and the increased tone in the erector spinae muscles will often lead to increased tension in the lower back, as well as an anterior pelvic tilt, which Janda termed Lower-crossed Syndrome. In lower-crossed syndrome there is decreased room for the diaphragm to move downward during proper breathing (diaphragmatic or belly breathing) as well as hypertonic hip flexors and weak/inhibited glutes. The Diaphragm, Psoas, and Quadratus lumborum (QL) share a fascial connection at the lumbar vertebrae. When proper diaphragmatic breathing is not observed, these muscles are prone to disuse, weakness and trigger point development – all of which can play a role in back and hip pain. It is also interesting to note that in the deep front line as Myers approaches the Psoas, he gives the option to take this line in a more medial direction upwards (as I laid out earlier in the article), or you can go from the psoas, to the iliacus, to the QL, which then takes us to the 12th vertebrae/rib and moves us upwards medially from there. So, the QL can be part of the deep front line as well. Finally, in the a hyperlodtic posture, the anterior tilt of the pelvis will have an effect on the entire lower-extremity, as increased anterior tilt will often lead to greater pronation of the foot, causing the client to present with flat feet. In over-pronation, the posterior tibialis is being put on a greater stretch (as the posterior tibialis helps to supinate the foot and is an antagonist to the peroneals, which pronate the foot). This flat foot posture could create trigger points to develop in the posterior tibialis as well as other foot and lower leg issues such as plantar fascitis (although over-supination has been shown to create this problem as well) and shin splints or medial tibial stress syndrome. Additionally, an anterior pelvic tilt and forward head posture, as common in those with an upper chest breathing pattern, will create an anterior weight shift to the entire body. This causes the plantar flexors – gastrocnemius and soleus – to become tight, as they need to work overtime, pushing into the ground, to ensure that we don’t fall over forward. Hypertonic plantar flexors can inhibit ankle dorsiflexion, which will cause the individual to turn their foot outward (externally rotate) and pronate to a greater extent in order to obtain the needed dorsiflexion (or fake dorsiflexion) for gait. Teaching clients to breath properly should be a component of every training program and now that we have all the nerdy stuff out of the way, here are a few ways to assess diaphragmatic breathing, re-teach it, and (if you are licensed to perform manual therapy) some soft tissue techniques for the diaphragm, psoas, and iliacus. The deep front line plays a major role in unlocking our overall ability to move properly. The diaphragm is a large component of the deep front line and should not be overlooked in our client assessment and training programs. Much like rolling the plantar fascia to improve function of the superficial back line; ensuring that the client is observing proper breathing patterns can be helpful in improving the function of the deep front line, decreasing the tone of hypertonic muscles, and increasing core strength and stability. Hopefully you find the assessments and techniques in this article useful for observing and improving your clients breathing patterns and function. Patrick Ward holds a Masters Degree in Exercise Science and is the founder of Optimum Sports Performance. He is a Certified Strength and Conditioning Specialist (CSCS) through the National Strength and Conditioning Association (NSCA), a Certified Personal Trainer (CPT) and Performance Enhancement Specialist (PES) through National Academy of Sports Medicine (NASM), and a USA Weightlifting-Certified Club Coach. In addition, Patrick holds a diploma in massage therapy and is currently licensed in the state of Arizona (LMT #12232). He specializes in clinical, therapeutic and sports massage, is certified In Neuromuscular Therapy, and has taken courses in Active Release Technique. Patrick’s professional experience working with a diverse clientele ranges from training for general health, to rehabilitation, to athletes who want to take their abilities to the next level. Patrick has served as a strength and conditioning consultant for various athletes of all ages and status. It's great to see Mike leveraging your knowledge by having a guest post from you. I have been following your blog and articles for some time now, and I am routinely amazed at your knowledge base and insight, fully realizing that the stuff I've been privy to is likely barely scratching the surface of what you know and bring to the table. Of course it is remarkably humbling following some of your work, as it reminds me just how little I know! Thank you for being one of those expert who is always so willing to generously share some of what you know. It is a privilege to be exposed to it. I do have one question regarding the techniques you demonstrated for the diaphragm, iliacus, and psoas. Is it at all possible for a person to execute a "poor man's" version on himself for times when treatment by a pro isn't available? Or would it simply not be very effective (if not entirely out of the question)? thought this was great reading. i am seeing a massage therapist who practises myer's work of fascial trains and has made wonders on me. after suffing a lifting injury as a nurse 9 years ago.. my next line she will be working is deep front line and after reading your blog i'm sure this is my major issue. thanks so much!! Awesome write up! I was wondering, is diaphragmatic breathing something we should be doing at rest, or during activities as well? Thanks! I have studied with Tom Myers and also have realized how important the Deep The Deep Front Line is key to structural stability and breathing patterns. As I worked with Tom’s Myofascial Meridians and delved more into the function of the Deep Front Line, I realized that creating stability through the axis of the DFL and accessing this line pre-movement, allowed my clients to create suspension and tensegrity in the other movement lines. I agree the Deep Front Line is key for people to access and integrate for buoyancy and alignment. Is there anyone out there using these methods in/near Concord NC? If so, please contact me!